“Climate change is the biggest market failure the world has ever seen”, stated Nicholas Stern already in 2006 [Stern, N. (2006). The Stern Review – The Economics of Climate Change]. Back then, the former World Bank Chief Economist and Advisor to the UK Government identified three main setting screws for climate protection: a price for the emission of carbon dioxide, no barriers to a more efficient use of energy, and innovations for the use of low-carbon dioxide technologies. To this day, Stern’s statement remains valid – particularly in view of the ambitious climate protection goals the world has imposed itself. 195 countries have signed the Paris climate agreement that aims at reducing CO2 emissions by at least 40 percent by 2030 compared to 1990 and by 80–95 % by the year 2050. In order for the European Union to meet the assigned target, energy production must come mainly from renewable sources. However, wind and solar power tends to be volatile and intermittent due to its seasonal nature. At times renewable energy supply will surpass demand – for instance, during sunny summer months – and vice versa. Energy has therefore to be storable in the long term and available when needed. This is exactly where the EU project STORE&GO comes into play. 27 European partners investigate the possibilities of power-to-gas (PtG) applications in the European energy grid as an important step in the energy transition. STORE&GO assumes that Europe can reduce its carbon footprint and – at the same time – cover large parts of its future energy demand only by making the most efficient use of renewable energies. However, the integration of growing amounts of renewable sources poses technological difficulties. Even though battery arrays are becoming more powerful and price-efficient, and thus more relevant to help stabilizing the electrical grid, they might not be able to face the growing number of renewable energy sources. Long-term and large-scale storage demands for higher energy density, lower costs and less self-discharging. One important alternative is PtG, because it allows for storing power by creating synthetic natural gas (SNG). In PtG systems, electricity from preferably renewable sources is used to split water into hydrogen and oxygen. While the oxygen can simply be released into the atmosphere, the hydrogen is combined with carbon dioxide (CO2) and converted to methane (CH4), which is basically SNG. This can then be stored easily in the existing gas grid and transported to various applications, whenever and wherever it is needed: for the generation of electricity or heat, or as fuel for vehicles or ships. PtG thereby facilitates the coupling of different energy sectors. Generating gas from renewable electrical power using PtG processes is by far the most promising way to store large amounts of energy. It also diminishes the need and costs for expanding the electricity grid. Figure 1: STORE&GO landscape and principle. 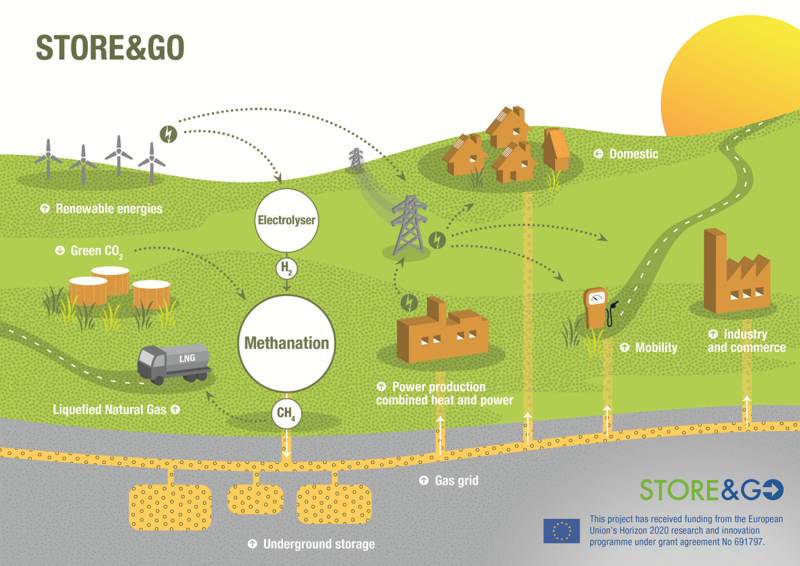 About STORE&GO: Funded under Horizon 2020 and coordinated by the DVGW (German abbreviation for German Technical and Scientific Association for Gas and Water), STORE&GO is currently supporting three pilot plants with different innovative power-to-gas technologies: in Falkenhagen, Germany; in Solothurn, Switzerland; and in Troia, Italy. The three demo sites provide highly diverse testing environments in terms of climate, grid type and topology, transmission and distribution grids, combination of energy sources and CO2 sources. STORE&GO testing works also aim at reducing energy losses and costs associated with the existing methods of converting energy. The overall goal is to create the best possible synergy effects for each location. All three pilot plants will be powered from the regular electricity grid, and at least two of them will make efficient use of the dissipated heat. At two sites, produced methane will be injected directly into the existing gas grid, while the third installation is going to liquefy methane to synthetic LNG (liquefied natural gas) to carry decarbonisation also into remote off-grid locations. Furthermore, STORE&GO partners are analysing the existing regulatory and legislative framework, in order to identify where PtG fits into the future European energy system. The researchers are also conducting a multi-country survey in order to identify the acceptance of the public in relation to PtG. The project partners hope to be able to accelerate the market uptake by identifying current and future business cases and models. Based on the findings, a European PtG roadmap will be developed as an essential outcome of the project. It will contain recommendations for political decision-makers regarding which role PtG may play in the energy system in the short-, mid- and long-term. This European roadmap will also serve as a guideline for industry and research institutions to follow up with their efforts to further develop and implement the PtG technology in the future European energy system. All in all, STORE&GO is an essential piece of the European puzzle of climate protection and the achievement of the Paris targets. This project has received funding from the European Union’s Horizon 2020 research and innovation programme under grant agreement No 691797. Contacts: Frank Graf, Project Coordinator, +49 7219640221, graf@dvgw-ebi.de, Head of Division Gas Technology, DVGW Research Center at Engler-Bunte Institute, KIT – Karlsruhe Institute of Technology. This text is by Daniel Stähr*, Dr. Stefanie Schwarz* and Dr. Simon Verleger* (* DVGW).